Maramagambo Forest - Nature Walks to the Python Cave | Bat Cave. Maramagambo Forest is found in Bushenyi district in south western Uganda and is a portion of Queen Elizabeth National Park. The forest is outstandingly associated with the Bat Cave. 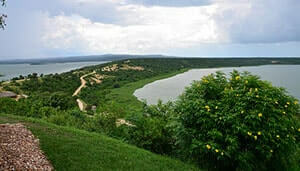 The forest is bounded by two crater lakes; Lake Nyamasingiri and Lake Kyasanduka. The woodland is a home to red-tailed monkeys, chimpanzees and Bates’s pygmy antelope (Neotragus batesi) among others are found here. 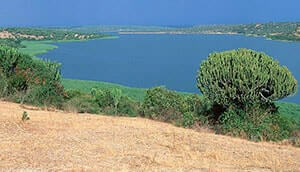 Maramagambo is very ideal for nature walks in a move to have clear visions of the fine-looking crater lakes. The habitually covered forest trails offer a great tour experience in the wild. The term Maramagambo is derived from locally from a legendary fiction where a cluster of young people got lost in the forest and they spent days in the forest without finding a clear route back to their village. But when they found a way and reached their village, they were unable to speak for some time as they were exhausted. So the inability to speak was christened ‘Maramagambo’, literally meaning ‘the end of words’. The Bat Cave is an outstanding spot in the forest. 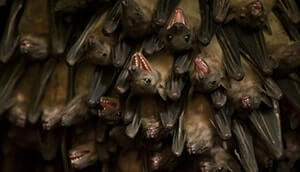 The Caves were shut in 2008 owing to a woman who presumably contracted the Marburg Virus. But later, the park in cooperation with the American Center for Disease Control set up a safe-viewing platform outside of the cave where hundreds of bats can be seen without any fear of contacting the Marburg Virus. The nature stride in the jungle is superlative for walkers and takes between 1:30 hours or more to hike. Hiking through the canopy-shaded trajectories offers you with a unique ecological feeling. During the hike, you will likely see various birds like the fawn-breasted wax-bill, dark-caped yellow warbler, black-headed batis, bat hawk, red-tailed bristle bill, sulphur-breasted bush shrike, African green pigeon, Ross’s turaco, Rwenzori turaco, the white-naped pigeons and the forest fly catchers plus so many more. The forest is well accessible through gate of Queen Elizabeth National Park near Jakana Lodge. The jungle is found 12 km off the main highway from Katunguru to Mbarara. Kazinga Channel is a 32-kilometre long water channel that connects Lake George in the east to Lake Edward in the west. 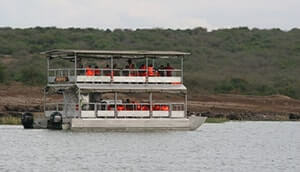 The channel is among the most paramount geographical features in Queen Elizabeth National Park with a magnificent view of the most vital wildlife in the park. 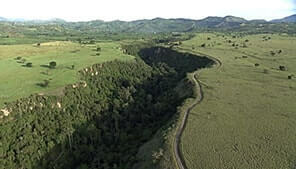 Kyambura Gorge is found in the far eastern side of Queen Elizabeth National Park in south western Uganda is roughly 1 km across and about 100 meters deeper. The gorge also known as the ‘Valley of Apes’ is drained by River Kyambura. Its a habitat to chimpanzees, other primate species and birds as well. The Ishasha Sector found in the Southern part of Queen Elizabeth National Park is well-known for the amazing Tree-Climbing lions. Lions that hang in the big fig trees are an exceptional attraction and a key highlight of any Uganda safari tour this large national park. 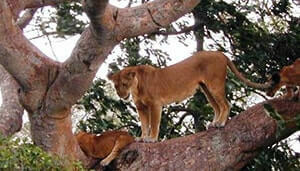 The Ishasha lions relax in the tree branches as they also spy on their preys from above. Kasenyi Plains are part of Queen Elizabeth National Park. 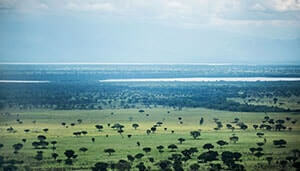 It is at these plains that the biggest percentage of game drive Uganda Safaris are carried out from. The plains are found on the western shores of the spectacular Lake George adjoining to the Kazinga Channel onto which the water makes a convergence. 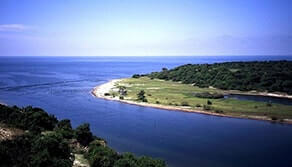 Mweya Peninsula is found within Queen Elizabeth National Park on the northeastern shores of Lake Edward. The peninsula is the corner point where Kazinga Channel joins the lake. This beautiful piece of land surrounded by water either sides is approximately 66 kilometres by road from Kasese town. Lake George found in western Uganda covers 250 square kilometres. The lake with an estimated depth of 2.4 meters is part of Africa’s Great Lakes system. Though the lake itself is not considered a Great Lake. This water body was named after a British Prince, George who later became King George V.
Lake Edward, the tiniest of the African Great Rift Lakes is positioned on the border between Uganda and the Democratic Republic of Congo. The lake is just few miles south of the equator. The first European to see the lake was Henry Morton Stanley, a Welsh explorer who visited the lake in 1888 during the Relief Expedition of Emin Pasha. 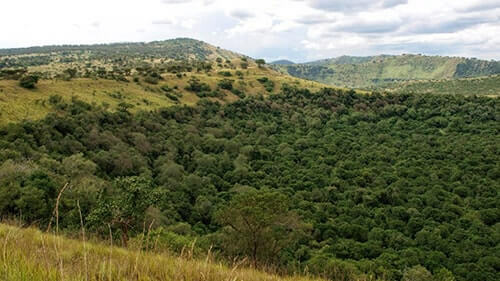 Maramagambo Forest is found in Bushenyi district and is a part of Queen Elizabeth National Park. The forest is prominently associated with the Bat Cave and the Python. The forest is bounded by two crater lakes, Lake Nyamasingiri and Lake Kyasanduka and is a home to the red-tailed monkeys, chimps and Bates’ pygmy antelope (Neotragus batesi) among others.